Read more about the documentary on the official website. Many photos and webisodes from the filming expeditions. Last edited by TNPihl on Thu Jan 22, 2009 12:45 pm, edited 1 time in total. That's so pretty and cool. I wonder if they might do a webisode on Jim Carrey's voice recordings. That would be cool! IMAX/Warner Bros. Pictures have updated the official website for Jim Carrey's next movie in theaters "Under the Sea 3D". Jim will be narrating the documentary, which is rated G by MPAA. The site now contains several beautiful wallpapers, buddy icons, takeaway email signatures, a screensaver, a section with games and the first official trailer! Howard Hall and Mark Thrulow shot Behind-the-Scenes footage. The footage has been used to create a series of webisodes documenting the five filming expeditions, they can all be viewed at the site. A very beautiful site with lots of information and fun facts. Click here to begin your journey. 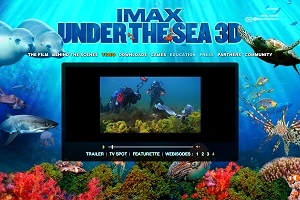 "Under the Sea 3D" opens exclusively in IMAX theaters on February 13, 2009.